The breedclub for Caucasian Ovcharka in Norway held it's annual dogshow in august, and as many as 13 Caucasian Ovcharka's was shown. Best of Breed was A-Varg and Best female was Tachetee Baroness. The full result from the show can be seen here. For the first time in Norway Kennel Rauland-Sandstøyl showed breeding class and stud dog class at a national show in Moss on july 29th. Both classes was rewarded with Excellent and got the prize of honour. 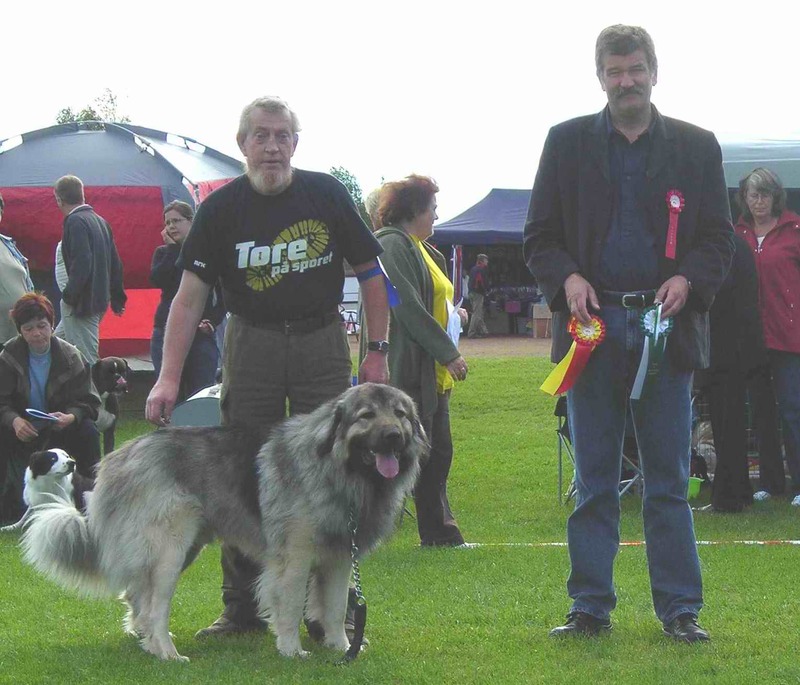 Stud dog class was shown with A-Varg, and with his group he was also Best in Show stud dog class. 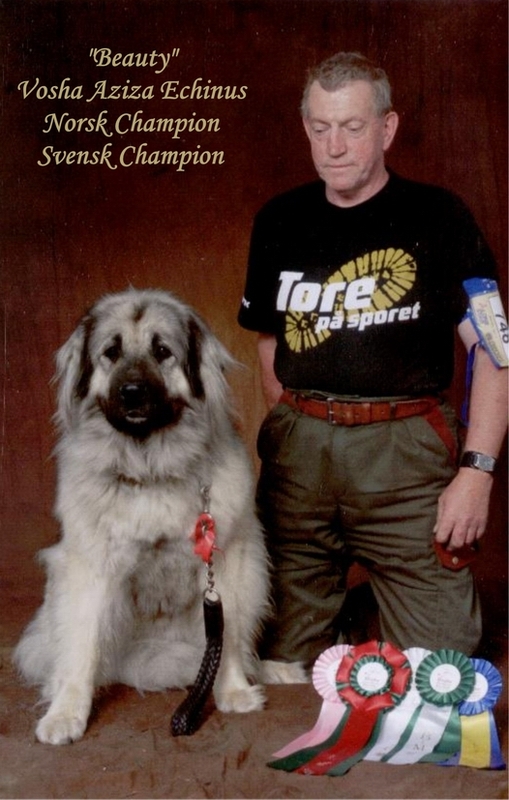 Photos below: Best Stud dog A-Varg, and the his stud dog class. Also in 2007 we have new champions. A-Varg became Norwegian Champion for special judge Libuse Ubrova at international dogshow in may. 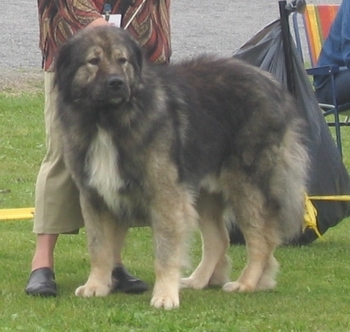 During the year 2006 the breed Caucasian Ovcharka have been in Norway for 10 years, one of the highlights in 2006 is that Best of breed at the world winner show was a junior female from Russia KLEOPATRA Tverskaja Gemchugina, E. Potemkina, Rosja. Kleopatra is from the same blod lines as three of our new imports to Norway - Nuch Such Vosha Aziza Echinus, Nuch Such Tamara Echinus and Zhulzhar Bugor Echinus. Also we got some new champions in 2006. Zoot LM Digitalis got the title Swedish Champion, his son Aico Nagazi got the title Norwegian Champion. Vosha Aziza Echinus got the titles Norwegian and Swedish Champion and Tamara Echinus got the title Norwegian Champion. 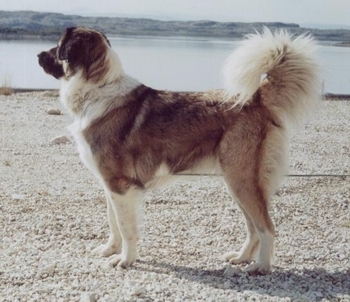 The first Caucasian Ovcharka litter was born in october 1996, registered in 1997 by breeders Line Merethe and Iipo Suomalainen. 11 puppies was born in this litter. Below is photos of three CO's from the this very first litter in Norway. From left: Micha, Hugo and Laika. One kennel from Hedemark that is now shut down have registered 16 litters. Cindy Andersen (Kennel Cevan, Vestfold) 2 litters one in 2003 and one in 2007. Peter Graasvoll and Jorun Grøstad (Kennel Rauland-Sandstøyl, Telemark) 3 litters one in 2005, one in 2006 and one in 2007. 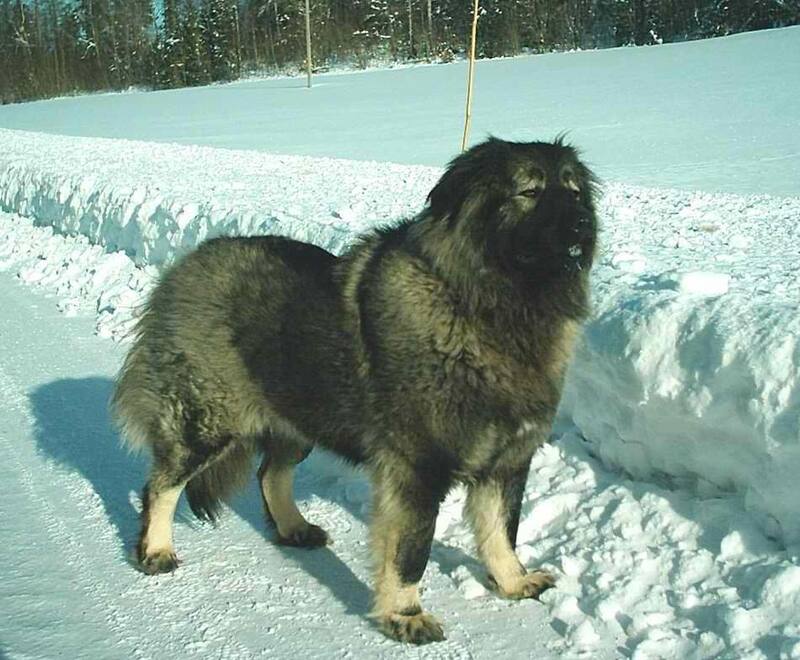 Officially only 124 Caucasian Ovcharkas have been registered in Norway from 5 different breeders/kennels in total. 12 of these are imports. The first two imports to Norway came as I mentioned earlier in the year 1996. They came from Finland and was imported toghether. During their stay in the Charantene station the pair was mated and became the parents of the first litter of Caucasian Ovcharka born in Norway 16th of october 1996.. The male SF14423/94 Archibald and the female FIN10296/95 Lessi was imported by Line Merethe and Iipo Suomalainen. From the first litter Micha was sold to Liise Sombroen and Astor Johansen, Kennel Champ-Bull. Micha was in the show ring 12 times in Norway and 7 times she was BOB. She got the titles NuCH NordV-98 and NV-97. 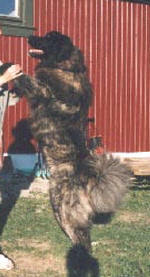 Micha was mated with "Maffe" SuCH Guanche De La Garita belonging to Elisabet Palmberg, Laxtjärn Kennel, Sweden. The litter from Micha was born 25.06.1998. In 1997 The kennel in Hedemark imported one female from Sweden, a female born at kennel Mörkömaan, Finland. The female S15732/97 Mörkômaan Enkeli did great in the show ring and during her 13 appearances in the show ring she was 9 times BOB and got the titles NuCH NV-98-00. Enkeli was in august 1998 mated with NuCh FinuCh NordV98 Shabo Iz Svetlogo Doma. Her first litter was born 28.10.1998. Enkeli's second litter was born in 2005, and information about this litter is further down under the import Mavr Medvezhiy Ugol. In 1999 yet another import came to the kennel in Hedemark. The female ZB96/0301334 Goda Norval Vom Wodantal from breeder Dirk Grossholz. Goda was shown 6 times and the result was 2 x cac and BOB/BOS. Also Goda was mated with NuCh FinuCh NordV98 Shabo Iz Svetlogo Doma. Another female LOSH818559 SuCH Vala was imported by the kennel in Hedemark in 1999. Vala are from breeder Janczarski Dariusz, Belgium. This female is ear cropped and have not been shown in Norway, but she have some good results from Sweden. Vala have 3 official litters here in Norway, see below for information. In the year 2000 there was registered 1 import to Norway. The male FIN31933/95 Mörkömaan Unelias. Unelias was shown 5 times, with 4 BOB as the result. He was not used in breeding. In 2001 there was no new imports, but 2 litters was registered. One is mentioned over under import Vala. The other litter is from Norwegian Born dogs. The litter was born 27.11.2000 and was registered in 2001. During the year 2002 no litters or imports where registered in Norway.. In 2003 3 litters was registerd. For litter born 2.2.2002, see over under import Vala. 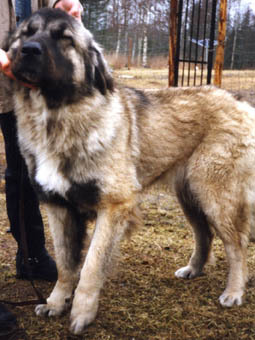 In 2004 the Kennel in Hedemark imported 1 male from Belarus and breeder N. Yakimovich. The male BCU328-001491 Mavr Medvezhiy Ugol is ear cropped so he has not been shown in Norway. In january 2005 he sired one litter, see below. Litter born 02.01.2005 in Hedemark OBS! Errors in the registery for this litter, wrong information from breeder. In 2005 4 new imports arrived in Norway. Kennel Rauland-Sandstøyl imported PKRII-76077 Agasha born at breeder Tatiana Yagodkina, Russia. Rauland-Sandstøyl also imported the female PKRII-81260NuCH SuCH Vosha Aziza Echinus and the male PKRII-81261 Zhulzhar Bugor Echinus. Cindy Andersen imported the female PKR.II-82894 SuCH NuCH Tamara Echinus. 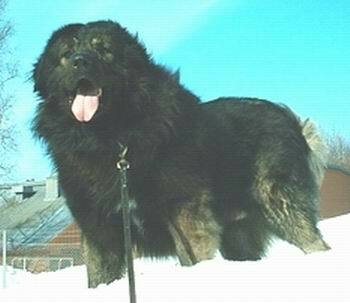 In 2005 3 litters was bornl, one from Vala born 24.12.2004 see under import Vala for more info, 1 litter from the import Mavr Medvezhiy Ugol born 02.01.2005, se over for mer info. and 1 litter from import Agasha, see below. In 2006 Kennel Rauland-Sandstøyl imported 1 female from Kennel Tachetee, Finland. FIN32101/06 Tachetee Dama is still a puppy and therefore have not yet any offical show results. It was registered 1 litter in 2006, also this one from Kennel Rauland-Sandstøyl. In year 2006 The kennel in Hedemark imported 1 female puppy from Belgium. Fabienne Du Vieilles Terres LOSH1002484. Unfortunately she was killed by the other dogs at the kennel (puppymill) in Hedemark as a young puppy. In 2007 it has so far been registered 9 litters, 7 litters in total 35 puppies by a kennel in Hedemark, and 1 litter of 8 puppies to kennel Cevan (Cindy Andersen), and 1 litter of 6 puppies to Kennel Rauland-Sandstøyl..
Litter 9 born 02.10.2007 in Hedemark OBS! Errors in the registery for this litter, wrong information from breeder. Unfortunately there is a number of unregistered Caucasian Ovcharkas in Norway. 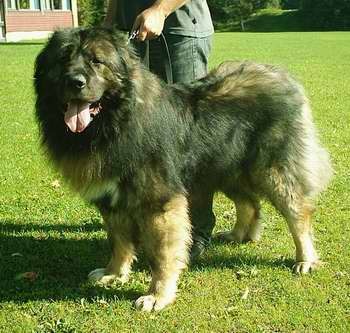 Many of these have been wrongfully sold as mixbreeds of some kind, usually varieties of Leonberger / Bernerse Mountain Dog / Great Pyreenes / St.Bernhard / New Foundland dog and so on. It was born 1 litter at the kennel in Hedemark in 2003, the litter is from Champ Bull's Goliat and LM Natasha. The litter is not registered. 1 female puppy from this litter was shown in puppy show at KSS show in august 2003. In spring/summer 2004 another two litters was born at Kennel in Hedemark, none of these litters where registered. Litter 1 was from Champ Bull's Goliat and LM Natasha. Litter 2 was from LM Big Boss and Vala. With these last two unoffisial litters, LM Natasha have at the puppymill in Hedemark given birth to 7 litters so far. On the 8th of march 2008 LM Grom Grom gave birth to a litter of three puppies at the kennel in Hedemark. The litter was sired by her fullbrother LM M-Goliat.